While ebooks are gaining traction in the bookselling world, the question of whether print will survive the onslaught needs to be examined. The American Publishers Association recently released numbers that showed that in the first quarter of 2012 the sales of ebooks have surpassed the sales figures for hardcover books for the first time. What does this mean for bookstores, authors, and readers? 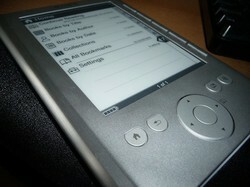 Will Ebooks Replace Hardcover Books? There has been much talk about ebooks and hardcover sales. This is because, unlike paperbacks which are released as much as a year after the initial publication of a book in hardcover, readers are demanding ebook versions with simultaneous release dates to the hardcover edition. Since publishers get their largest profit margins from the sale of the hard covers, this has them worried that a large portion of their profits will be eaten away by ebook buyers. It appears, however, that the sale of ebooks isn't primarily cannibalizing hardcovers, but rather that it's killing the mass-market paperback format. What's Your Preferred Format For Books? Mass-market paperbacks used to be the most ubiquitous book format. You could find them in corner stores, supermarket checkout lines, airports as well as bookstores. Made in small dimensions from cheap paper, they could be sold for considerably less than hardcover editions. It's likely, though, that this once popular format will cease to exist within a decade. The Beatles once wrote about wanting to be a "Paperback Writer." With the rapid decline of the format, one wonders if the song will become meaningless to future generations. It's more than just ebooks that are eating into the paperback market, although most ebook purchases are books that might otherwise have been bought in the mass-market format. The mass-market paperback has also been a victim of deep discounting by online retailers. Amazon, in particular, often deeply discounts the hardcover edition of bestselling ebooks to such an extent that they are only a few pennies to a dollar more expensive than the paperback. Even retail stores are forced to put deep discounts on new hardcover books to compete. Retail space for mass market books has also dwindled, cutting into the sales of the format. Stores like Walmart that used to have a healthy stock of mass-market paperbacks have now reduced their purchases of that format in favor of larger and higher-quality trade paper and hardcover books. Even bookstores like B&N have reduced the display space they used to have for mass-market paperbacks. And finally, for all those readers that don't plan on reading a book more than once, or who don't want an embarrassing copy of the steamy romance they've been reading around the house, ebooks are the solution. Who Will Be Most Affected by the Death of the Paperback? Publishers and authors will probably not be too bothered by the death of the mass-market paperback. Ebooks have fewer fixed costs associated with their production and distribution, yet cost about the same as a mass-market book, so the cannibalization will need some adjustment, but it won't be problematic. Bookstores, particularly independents, who don't have a way to capitalize on the popularity of ebooks are going to suffer from the inexpensive editions. But the worst hit will be used bookstores, for which mass market paperbacks are like bread and butter.